The new group of pigs rooting around in one of their paddocks. Well September is here and with it the promise of fall right around the corner. The morning and evening temperatures have dropped into the 40’s and 50’s. The day time highs have been in the 70’s and 80’s, and both the animals and farmers are much happier with that. We have our first couple of trees hinting at changing colors and dropping leaves for us to add as mulch to the gardens. Sweet potatoes, squashes, beans, and corn are getting close to harvest time. Our last batches of broilers for the year have arrived and are growing nicely. And while having intern help is absolutely wonderful during the summer, fall is a wonderful break from the hectic pace of the spring and summer seasons. Our spring and summer have gone swimmingly, even through the rough drought earlier in the year. Fortunately we didn’t have it as dry and hot as people in Arkansas, Illinois, and Missouri, but it was rough. All four of our creeks stopped flowing and dried up. Both wells went dry. Both ponds dried down to mud and muck. We hauled water in tanks and 5-gallon buckets two or three times a day to all of the critters. Do you know how much water 7 cows and 20 goats require when the temperature is in the mid 90’s and the heat index is 110? I didn’t before, but I truly appreciate it now. And that’s not to mention hogs, rabbits, chickens, ducks, turkeys, guineas, and . . . But through all the heat and pestilence (my god, the flies!) all of our animals did fine. They really earned their keep this year! Both cows had healthy bull calves that are now growing steers. One of them is going to be for our family and the other has been sold to another fine family (Thank you Joe G!). Our new bull Russell the Love Muscle (aka Shuter’s Last Chance from Shuter Sunset Farms in Indiana) has hopefully impregnated the two cows plus the two heifer calves born in 2011. That means our herd will grow by almost 50% next year! We’ve gotta get the water situation resolved! Here’s hoping for 4 strapping young calves in April next year. Almost all the goats raised twins this year. Every doe had a set of twins, but the first goat to kid did so 5 weeks early and we lost both of those kids. All the other does twinned as well and those kids all thrived. After the kids were born we traded our stud buck Apollo for 2 Boer bucklings (Desmond and Tutu). We also kept back our best pure Kiko buckling for breeding. The current plan is for him to breed all the does except his mother. Desmond the Boer will get to breed the other Kiko doe and all 5 doelings we are retaining from this year’s kidding season. We’ve sold two other the remaining kids (Thanks Jennifer and Rachel!) and will be processing the two remaining kids shortly. That will leave us with 3 breeding bucks, 6 older does, and 5 young does to carry over for next year. With 11 does bred for April delivery, we should have quite a kid crop next year if everything goes well. We raised our first batch of hogs this year! They tilled our gardens and turned our compost for them before we turned them into the best pork I’ve ever eaten. We kept one of the first four we raised for ourselves and sold the others (Thanks Chastity W, Kelly M, and Melane H!). 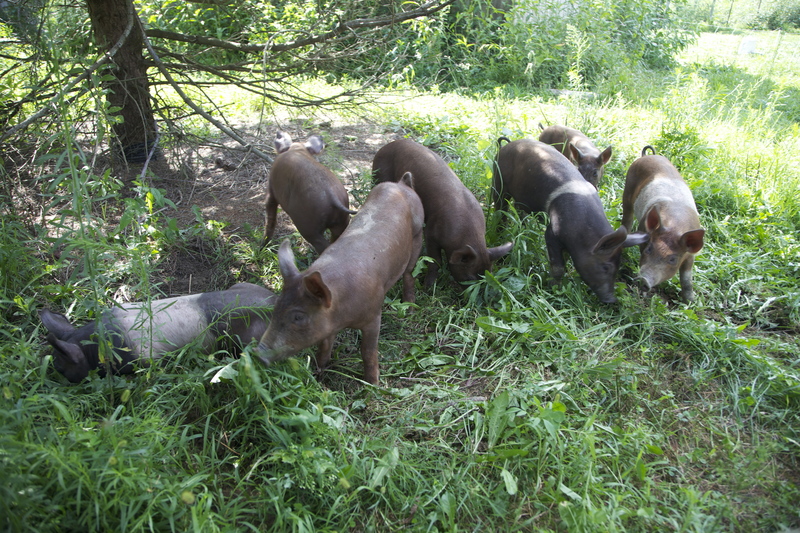 Everything went so well and we (and our customers) loved the pigs so much that we got another group to raise for throughout the fall on our nut fall in the woods. The first group tasted so good that I can’t wait to see how they taste after they fatten on hazelnuts, hickories, and acorns! In this group we have 7 that are a Red Wattle and Hampshire cross and 2 that are a Berkshire and Tamworth cross. We still have 2 available if anyone else is interested. They should be available sometime between late December and February, depending on how fast they grow. Right now the are enjoying the pasture edges, digging out Johnson grass roots, rooting out falling nuts, and cleaning out our new fence lines. The chickens are doing great as well. We’ve rebuilt our coyote-decimated laying flock and have run through several batches of broiler chickens (Thanks Joe G, Sarah M, Christine M, and Ronnie & Jake P). Next year I truly believe that we can have our first year without ordering any chickens from a hatchery – all chicks should be produced on-farm. Sustainability! The only animals that had a really bad year were the rabbits. It was so hot that we lost many of them to heat strokes even though they were as sheltered as we could make them in the barn with fans and cool water. It is interesting to note that we didn’t lose a single rabbit that was on pasture in a rabbit tractor. Only the ones in the hutches. This reinforces my desire to build larger portable tractors and get all of our rabbits on pasture throughout the year. They just do better and seem far more comfortable. We are also coordinating with Lindsey’s father Ronnie to expand the gardens next spring! Lindsey’s parents moved to nearby Campbellsville this year and having them nearby has helped tremendously. Lindsey and I even got to go to Cincinnati for a whole day and see a Cubs doubleheader thanks to Ronnie and Jake farm sitting. Ronnie approached me about combining efforts and growing more produce next year, so we should have more than enough for 2 families and some to sell with meat purchases. Right now we are busy on our fall plans. I’ve got to finish stuccoing the Indian dwelling. Elden and I are going to build a fence around the south field to open up more grazing and foraging areas for our animals. I am building a winter corral and hay feeding area for our cattle and goats that will last and withstand the pressure the animals exert on the fencing. And, of course, the job search continues in the rough economic climate. The job is necessary so that we can finally get a tractor to help us accomplish some of the tasks that we either currently rely on neighbors to do or just don’t get done at all. Well, that’s the update. Thanks for reading! I really enjoyed reading this.You two are amazing!!!!! We have been missing your posts. Congratulations on all the good progress that you have made in just a bit over two years. It’s great that your in-laws are living nearby and can enjoy working with you and benefit from the wonderful eating. Julie and Lyle Heim, friends of your grandmother Sally.